In my endless quest to devour all of Chicagoland’s local beers, I am sad to say I have neglected a few of the area’s major upcoming breweries. Metropolitan Brewing, located in the Andersonville neighborhood, is one such brewery that I haven’t given enough time to. Metropolitan is a relatively new arrival to the city’s craft beer scene. It was opened in January 2009 by Doug and Tracy Hurst, a beer-loving married couple who decided to launch Chicago’s first all-lager brewery. They have three main beers: a kölsch, copper lager and “bright lager”. 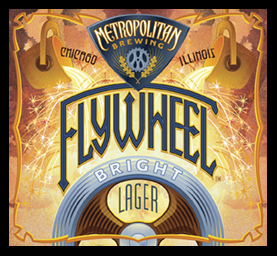 Tonight I opted for Flywheel, their bright lager. When poured into a glass, Flywheel is light in appearance. Very light, actually, with a beautiful clear golden color. The bottle’s label declares this is a “German-inspired beer” and that is indeed what it is. It’s easy to tell that this is an American beer due to the added spicy hops, but there is a clear German influence prevalent as well. The hops make this a little more bitter than expected, and the bitterness lingers on the tongue after tasting. Flywheel doesn’t have a lot of character, but it is very drinkable. This is a good session beer. I wouldn’t classify it among the best pilsners I have had, but it is good quality and I would drink it again. In the coming weeks, I will make an effort to try the rest of Metropolitan’s offerings to see how they compare.